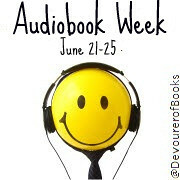 As you probably know, next week is Audiobook Week here at Devourer of Books! If you haven’t heard about Audiobook Week yet, check out my first post on the topic. There is going to be a whole lot going on here, and I hope that you will consider taking part! I will have daily reviews as well as daily discussion/exposition topics on audiobooks. At the end of each of my reviews I will have a Mr. Linky for you to leave a link to your audiobook review for the day, same with the discussion topics. If you have anyone guest post on your blog about audiobooks you can link that guest post under the discussion topics as well. By the way, if you would like to participate but do not have your own blog, you may want to consider joining the new site Audiobook Community, which does have a built-in blog feature. If you do join, friend me, I’m Jen – Devourer of Books there. I’ve had some generous sponsors, so I have LOTS of copies of audiobooks to give away to give away next week. Every day I will choose one person who has included a link to a review and one person who has included a link to a discussion post to win an audiobook, and will choose at least one other winner from commenters here next week. A few other participants will also have opportunities to win. I will have a list of all the audios I have available (and where they can be shipped), winners will email me their selection and I will remove them from the list. Since I’ll be choosing from the Mr. Linky, PLEASE make sure your blog has an easily-found way to contact you! Ideas: Why do you like them, why did you first try them, why have you NOT tried them, etc. Ideas: What do you include? How do you rate an audio if the narrator is good but the story isn’t (or the other way around). Do you let people know the book was an audio off the bat, or do you surprise them with it at the end, ‘trick’ them into reading the review? This will be up Wednesday morning, but it should be quick and easy for you to fill in if you so desire! Thursday: When do you listen to audiobooks? Pretty self-explanatory, but bonus points if you include pictures of yourself listening as do you whatever it is you do! Friday: My favorite audiobooks/what audiobooks do you recommend? How/when did you start listening? Can you remember your first audiobook? I hope to see you back here next week! I’m very excited about this event! You are doing a amazing job with this! I hope it’s a yearly occurrence. I’m so excited about this! Great job, Jen! I love this idea! I have posts ready to go starting Sunday. I’m definitely in on this, and already working on writing my posts! I have a couple different topics planned for Wednesday and Friday that aren’t on your list. Just got back from vacation, so I am sliding in in a harried, unprepared state of mind, but I am there! I just constructed a post for Monday (which is also my B-Day!) with Sandy’s Audies. I also rearranged to have audio reviews all week. I will post on your daily topics when I can. It is so hard to get caught up after being gone for two weeks! Looks fun, but unfortunately I’ve already got next weeks posts pretty well planned out. I may be able to combine Wednesday and Thursday’s topics into something, but likely won’t post it until at least Friday or Saturday. Will have to play it by ear at this point. Nice job Jen! This is going to be a great audiobook celebration! I had to come back and apologize for that “play it by ear” comment. I’m now locking myself in “totally unintentional but inexcusably bad pun” detention for the rest of the morning. This sounds awesome! I can’t wait for Monday! Very cool. I do enjoy audiobooks, that is when I am in the mood for them. I look forward to your posts next week, should be interesting and fun. Thanks for stopping by my blog, not certain if you subscribe to comment replies so I wanted to tell you, Yes, I most definitely agree that Food Rules is doable, and I agree that it does take actual doing. Actually the doing is the hard part as it is with any sort of change. Thanks for posting about the book. While I’m sad to say I’m not participating in Audiobook Week because I myself don’t really read audiobooks (though I’ve been talking with Nicole about it and I think I will need to purchase some to keep me company while I’m doing housekeeping stuff around my apt), I plan on stopping by each day to read some of the thoughts. I’m particularly interested in what you and everyone else has to say about *how* to write an audiobook review/if the approach is different than that applied to reviews of physical books. This is a great idea! I should be home from my travels next week, so I hope to participate. I am a big fan of audiobooks, and it’s about time they got some respect. Can’t wait to share this week with you – It will keep me motivated while moving chaos surrounds me. I downloaded Wench and I’m going to start it this weekend! Jennifer, I thoroughly enjoyed reading Wench. I don’t think there are any spoilers in my review but I still won’t link to it. It’s easy enough to find because my blog is small. I just started in April. Or, if you’re like me, since you already know what the book is about, you might want to wait until after you’ve read it or completed your own review. I do that a lot. I have Inkheart on a playaway that I’m going to start listening to while I walk. I’m really interested in your Audio Week, so I’ll be back for sure! I can’t wait! I’m already thinking about certain posts and reviews! I am so looking forward to this event. I think you tailored made the question for Friday just for me. LOL! This is going to be a great event, Jen! i will definitely be participating and am using it as an excuse to get caught up on my two audiobook reviews that i have outstanding. I’m going to write a post for this this weekend. I’m looking forward to seeing all of the posts people write about audiobooks. I just wanted to say THANK YOU SO MUCH for offering this terrific focused meme! I will not be participating as I have always struggled with the audio book format (I am such a visual learner that my brain is constantly wandering when just listening to a book) — but I WANT to learn. I know that I will be well-versed in this media after the week is over. Well, my first piece of advice is that I can *never* ‘just listen.’ I’m with you, my eyes and hands have to be doing something or I’d go crazy. I only listen while doing things like drive, clean, exercise, etc. My second piece of advice is just keep trying (and maybe try audio rereads of old favorites), because it takes awhile to train your brain. Glad you’re excited about this week! Hope you get a lot out of it! This event could not be timelier! I just listened to my first audiobook last week. Then I was so glad to find your post announcing Audiobook Week. I’m all ears! (pun intended) This is a great discussion; and I’m taking everything in. If someone would be so kind to answer one of a few questions I have about audiobooks. Both of the selections I’ve listened to (one is still in progress) are of books I’ve read some time ago. But I still feel the need to read the printed page, which seems rather redundant. Will that go away? Did anyone else do that and now they don’t? I also have a question or two that tomorrow’s topic might answer. Uh ohhh. Where’s the room for intentional puns? Looking forward to your posts. Great timing on Audiobooks as I just received one last week; not sure what to think of them as I’ve not listened yet but seems very convenient. Audiobook Week Is Here! [TSS] - my books. my life.